On Saturday August 11 animal welfare charity Viva! 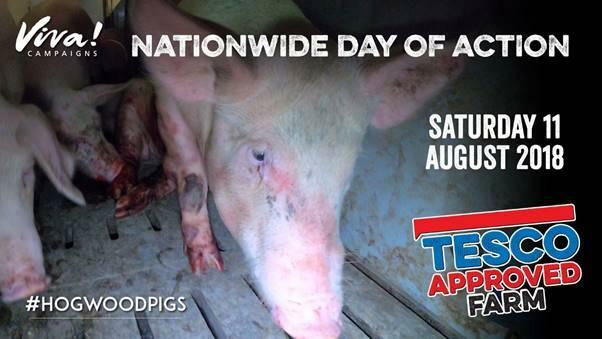 and animal rights groups are organising a peaceful Day of Action outside Tesco stores nationwide, asking that the supermarket giant stop buying pig meat from Hogwood “horror farm”, Warwickshire. The Day of Action follows Viva! campaigns’ second shocking investigation in July 2018, released in the Daily Mail and Daily Star exposing the neglect and abuse of factory farmed pigs. The latest disturbing footage taken inside Hogwood shows horrifying scenes of animal suffering—extreme overcrowding, filthy barren sheds, sick and dying animals dumped in gangways with no access to food or water, and one pig being eaten alive. Hogwood carries the Red Tractor seal of approval and supplies meat to supermarket giant Tesco. Local groups will assemble outside Tesco stores nationwide on Saturday August 11 with placards, leaflets and petitions for the public to sign, asking Tesco to dump Hogwood. This huge national Day of Action includes over 150 regional demonstrations across the UK - making it the biggest Viva! Day of Action yet! Last year, Viva! Campaigns reported Hogwood to the government’s Animal and Plant Health Agency (APHA), Tesco and Trading Standards. As well as creating a petition demanding APHA close the farm down, which gained almost 50,000 signatures. Despite providing indisputable evidence of clear animal welfare breaches, all denied that there were any issues on the farm. This blatant denial of hard evidence raises the question of how closely organisations such as Red Tractor, Tesco, and APHA work together to conceal the truth about Britain’s farming industry. A recent exposé in the Daily Mail revealed that only one in a thousand Red Tractor farm inspections are unannounced. Unfortunately, these conditions echo the lives of most pigs in Britain (and elsewhere), who endure short and brutal lives on farms where their welfare is of far lower importance than production. The Day of Action forms part of Viva!’s Week of Action for Hogwood Pigs which includes a petition asking Tesco to dump Hogwood pig farm as a supplier. The investigation video and petition can be viewed at viva.org.uk/hogwood.